The International Space Station may have a tiny bathroom and endless toilet problems, but future spaceships will have artificial gravity so you can run water over your hands in a gleaming receptacle. These futuristic water basins, like this curvy one by Kohler (pictured), will be to today's sinks the way videogames are to shuffleboard. We've got a few designs for your interstellar life pod, below. Here's a Klingon modernist style sink, by Ronbow, on the left. And on the right is some kind of alien pod sink, by Scarabeo. They might look like urinals to our Earth-trained eyes, but to the creatures of the black hole Sagittarius A*, they're definitely sinks. On your spaceship in 200 years, you'll want this Villeroy and Boch sink for your swanky cabin - only it won't be made of glass. Instead it will be extruded nano-diamonds. From the bizarro world, this is an inside-out sink by Althea. It just looks so wrong that it must be right for Bizarro. This Stone Forest sink looks like a slab of marble in anti-grav, sort of floating against the wall. Villeroy and Boch sink. Stone Forest sink. Scarabeo sink. Althea sink. 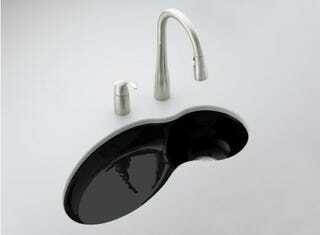 Ronbow sink. Kohler "entertainment sink."